What is the difference and does it matter?! I’ve been asked this question a lot across the years… does the difference in scope between these terms matter? I always answer, no it doesn’t really matter, but the scope of responsibility is important to make the most of managing the opportunities. So the scope of digital marketing activities does need to be agreed within a business and/or between a company and its agencies. The books I’ve written have actually had three different titles, updated with the times. I started with Internet Marketing, then Emarketing and in 2012 renamed the original Internet Marketing book to Digital Marketing, about time too since I was involved in developing the syllabus as an examiner for the IDM Diploma in Digital Marketing back in 2004-5 when the term was hardly used at all – so it’s been great to see “Digital Marketing” adopted as the “de facto” term! This naming reflects these trends in use of the terms shown by Google Trends – here shown in the latest June 2015 update to Google Trends. You can compare to the latest here – the UK tends to be ahead of the curve here. I used this succinct definition to helps remind us that it is the results delivered by technology that should determine investment in Internet marketing, not the adoption of the technology! These digital technologies include Internet media such as desktop and mobile web sites and e-mail as well as other digital media such as wireless or mobile and media for delivering digital Television such as cable and satellite. 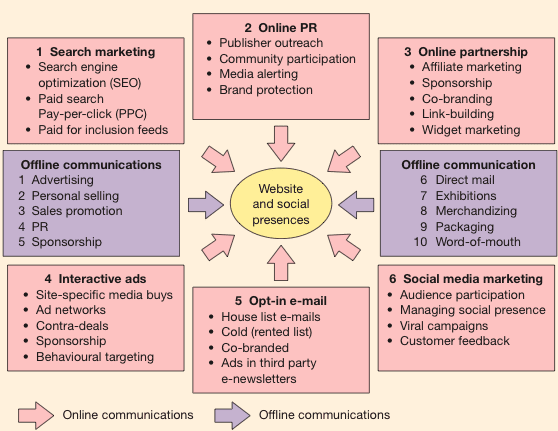 In practice, Internet marketing will include the use of a company web site in conjunction with online promotional techniques described in Chapter 8 of the book such as search engine marketing, interactive advertising, e-mail marketing and partnership arrangements (affiliate marketing) with other web sites. Some businesses who «want to be top in Google», simply consider Internet marketing to simply equate to Search Engine Marketing, but while this is important this scope is too narrow to take full advantage of digital media. These can be facilitated through the desktop or mobile web. We have more details on the strategy in our visual emarketing strategy guide. These techniques are used to support objectives of acquiring new customers and providing services to existing customers that help develop the customer relationship. However, for Internet marketing to be successful there is still a necessity for integration of these techniques with traditional media such as print, TV and direct mail. This is multi-channel Emarketing. Emarketing can be considered to be equivalent to Internet marketing and Digital Marketing. Most in the industry would look at it this way. 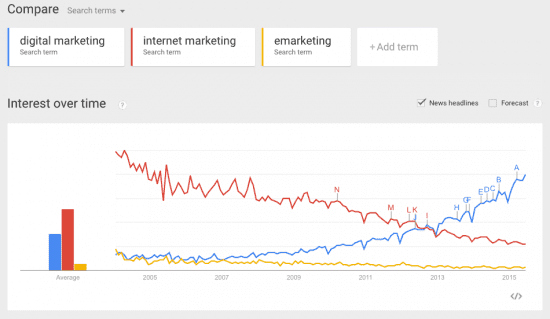 Digital marketing is yet another term similar to Emarketing. It’s a term increasingly used by specialist digital marketing agencies and the new media trade publications. The Institute of Direct Marketing has also adopted the term to refer to its specialist professional qualifications. developing a planned approach to reach and migrate customers to online services through e-communications and traditional communications. Retention is achieved through improving our customer knowledge (of their profiles,behaviour, value and loyalty drivers), then delivering integrated, targeted communications and online services that match their individual needs». The second part of the description shows that it should not be the technology that drives digital marketing, but the business returns from gaining new customers and maintaining relationships with existing customers. Online channels should also be used to support the whole buying process from pre-sale to sale to post-sale and further development of customer relationships.